Today the FCC announced that the overall E-rate funding cap has been raised to $4,062,030,726 using an inflation factor of 1.8%. Using this factor, we expect USAC will announce the following revised Category 2 per-pupil (and per library square foot) budget amounts that can be used for Funding Year 2018 (note, these aren’t official until they’re announced by USAC but because so many of you are in the process of filing, I wanted you to have these updated figures as soon as possible). 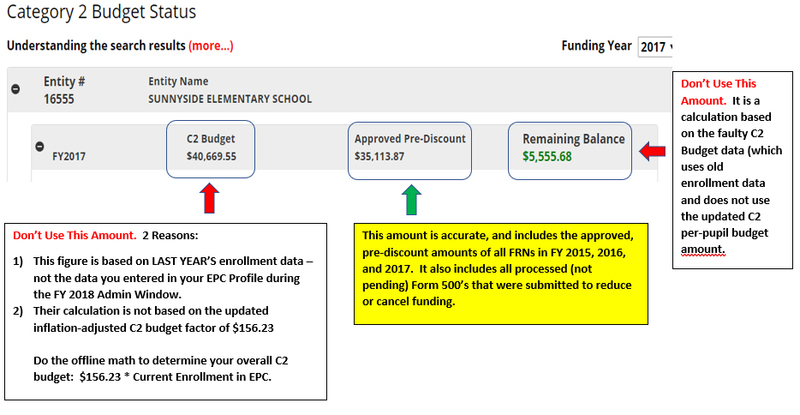 Use the enrollments (and per square footage) that were entered into each school’s EPC profile during the FY 2018 Admin Window, and multiply them by the amounts shown above. Then subtract any Category 2 pre-discount amounts that were been committed (not disbursed) in FY 2015, FY 2016, and 2017 for that school. Then subtract any pre-discount commitments that were returned to USAC via a Form 500. This tool can be somewhat helpful in determining each school or library’s remaining C2 budget. Unfortunately, it does NOT use the updated enrollments from the FY 2018 Admin Window and has NOT been updated for the revised FY 2018 C2 budget amounts. However, the “Approved Pre-Discount Amount” – the middle figure – is accurate and encompasses all previous pre-discount committed amounts and all processed Form 500’s. Whatever you do, don’t request more Category 2 funding for a school than what remains in that school’s budget. Why? Your application will likely be moved to the end of the PIA review list, and PIA will just make you reduce your funding request anyway. And while this sounds easy to do, it’s not because you will have to explain exactly which component from which FRN Line Item must be removed in order to come in under budget.